In a shallow dish, combine the black and white sesame seeds and stir to mix. Season the tuna with salt and pepper and dredge in the sesame seeds, coating the tuna evenly. In a searing pan over high heat, warm the oil until smoking. Arrange the tuna in the pan (do not overcrowd) and cook until the white sesame seeds start to turn golden underneath, about 1 minute. Turn the tuna and cook until the white sesame seeds start to turn golden underneath, about 1 minute. Transfer the tuna to a cutting board and cut into 1⁄4-inch-thick slices. 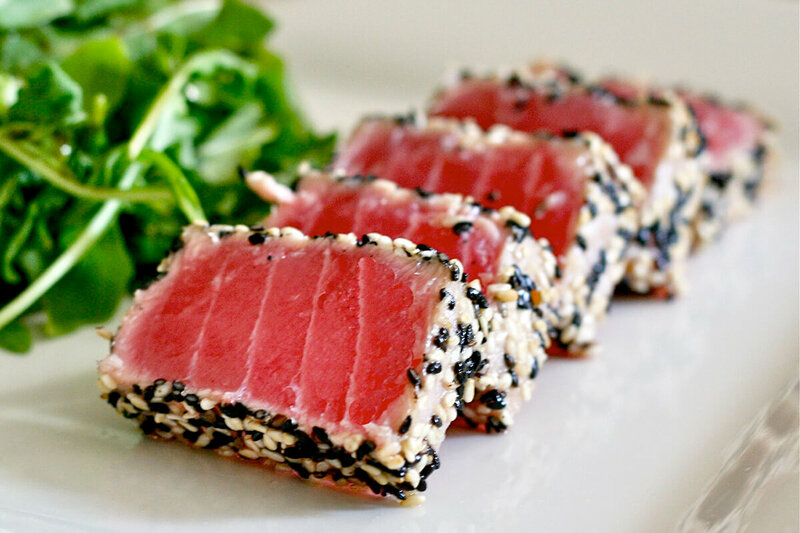 Arrange the tuna on individual plates, overlapping the slices. Serve immediately.